I am very excited to share this blogpost with you today as I think you will find it to be very motivating. For some strange reason, I’ve never told you all about my badass client Caren Kilgore. Caren has been training with me online for 7-years now. She has been lifting for 10-years total. What I think is especially interesting about Caren is that she did not even start strength training until she was 48-years old. As you will see in the training highlight reel below, she has a very lean and muscular physique. Her scale weight has remained about the same for the last decade, so that means that she has not only increased her strength levels an appreciable amount (and arguably decelerated the aging process), but she has also packed on a considerable amount of lean mass while simultaneously decreasing body fat. Most of my regular followers know that I frequently espouse the importance of progressive overload on this blog and on my social media posts. By adhering to these principles, Caren has gradually added muscle to her frame year after year. Her very first set of hip thrusts were with 80-lbs, and as you can see from the data below, she has succeeded at building enviable strength well into her 50’s. I sincerely hope that Caren’s journey inspires many people to follow suit. Much respect to Caren’s husband Tom who trains with her, pushes her, films her, tracks her progress, re-racks her weights, and supports her week in and week out – you’re good people Tom! If you aren’t already strength training, it is never too late to start. Don’t ever forget – age ain’t nothin’ but a number. Click HERE to check out Caren’s IG. 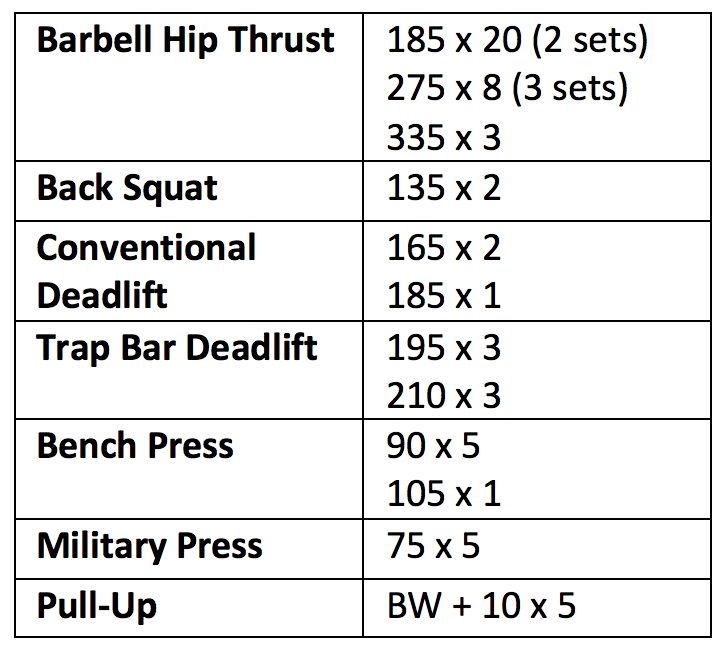 The post Your Optimal Training Frequency for the Glutes Part I: Exercise Type appeared first on Bret Contreras.